What did Hedges say (or, rather, try to say) that was so inflamatory? ColdType's special 14-page report reprints Hedge's speech, together with the transcript of a radio interview with Democracy Now! 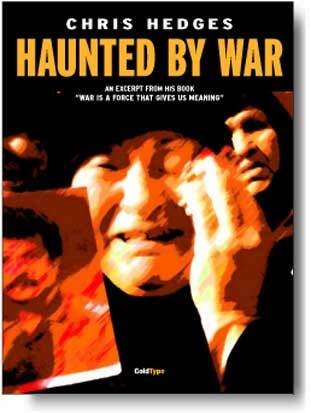 's Amy Goodman and an introduction by Danny Schechter, editor of Mediachannel.org. May 3 has been designated World Press Freedom Day to recognise the sacrifices made in the struggle for freedom of the press and to put pressure on the numerous countries that continue to deny their citizens this basic human right. This day marks the anniversary of the Declaration of Windhoek, a statement of principles drawn up by African journalists calling for a free, independent and pluralistic media on that continent and throughout the world. The Declaration affirms that a free press is essential to the existence of democracy. 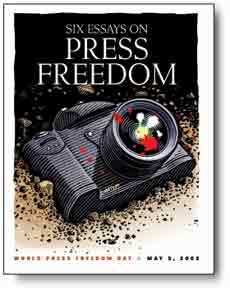 This special publication contains essays on press freedom from journalists in Iraq, Thailand, France, South Africa and Gambia. It also gives details of the deaths of 47 journalists killed in the line of duty in 21 countries during 2002. The illustrations were provided free of charge by leading editorial artists in Canada, France, South Africa and the USA.